A few years ago, when I was starting to work with historical and alternatives printing techniques, I discovered the site of Galina Manikova, and I suddenly fell in love. I finally founded an artist/photographer who does not simply printed on paper, but worked with an incredible variety of media and techniques, and the result fully met my tastes. Years have passed, but I continued to admire the works of Galina Manikova, often returning to her site. I was therefore very pleased when she agreed to write a review for Camera Obscura, in which she speaks about her latest project: large format photographs on ice. Following text and photos by Galina Manikova. Photographs are two-dimensional drawings of light reflected from three-dimensional reality. Most of the time we see photographs on paper, either on photographic paper framed on the walls, or prints in the books. From the very beginning, when I was still learning things about photography, I had a wish to break away from that tradition, to find a way back to the three-dimensional reality that photographs represent. I have been through all the different possibilities, like extending the pictures out of the frames to the walls, or cutting holes and bending the pages of books. However the most giving and intriguing experiment has been to print on transparent materials and mount pictures in many layers. My first experiments in that direction started already in the early 70-ies, while I was still a student at the art academy in Jerusalem. I kept printing high contrast images, waxing the photographic paper and building new landscapes with those cutouts. My main interest has been to create illusions of volume and perspective. I have been experimenting with photographic emulsions on clay and ceramic forms, projecting images on three-dimensional forms in such a way that the pictures were deformed according to the forms. Later I turned over to transparent materials like glass and plexiglass, which allowed me to mount the pictures in several layers, use light in such a way that images got projected around the forms and got integrated in one another. 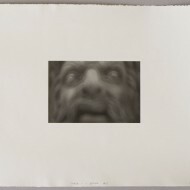 Again, I wanted to take the two-dimensional image out of its frame and border, extend it to the space around, include the spectator in the image and reflect both the images and the viewers upon each other. The first popular series of trees on plexiglass were first made with direct emulsions, like silver gelatin, cyanotype and van dyke. Unfortunately my public in Norway could not value this according to the effort, so slowly I started making these small sculptures called “blocks” or “cubes”, by mounting transparencies between two sheets of thin plexiglass. The price of each piece went down, but the popularity went up, which allowed me to create bigger installations and commissions based on the same idea. Technology developed further. At first the biggest sculptural elements were made by silkscreen, printing the images on glass and plexiglass, like in the project called “Learning garden” in year 2000. Later, there came new printing methods on transparences, which could be laminated on glass, as in projects like “Haa” or “Royal”. See all my earlier work under “projects” on www.galina.no. 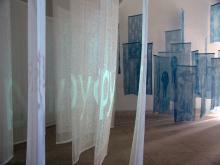 I also started working more and more with transparent textiles such as silk and thin cotton, hanging them in many layers or projecting images on them, like in the series of exhibitions about walls. All these installations are to find on the bottom stones on my computer art project www.wailingwall.no or on my main website under “projects” after 2004. During my stay in Japan at Shigaraki Ceramic Cultural Park, I went back to working with clay, thin porcelain paper with images, created by either color or relief. There is a great difference between silk and clay, but at the same time no difference at all in terms of using the same idea: light, layers, volume, space and coordination between pictures, borders and reflections. 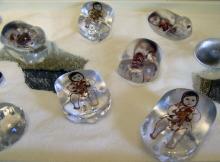 The exhibition “Sweet sugar baby doll” combines images on both glass, silk and even on cake, making edible art. 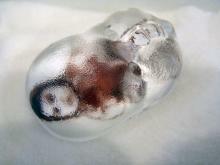 Cast glass forms had images printed on one side, which got deformed and reflected being exhibited on mirrors. After experimenting with cast glass and cast gelatin and gum candies, I turned to cast water, ice. Again there is a great difference and at the same time no difference at all between materials. Sometimes you cannot know if it is glass or ice before you touch the surface and feel the temperature. What one has learned from one material can give one a great surprise and a quality jump, when applied to a new material. I do not believe in specialization based on materials. I am a supporter of crossing the borders and exploring the unknown. 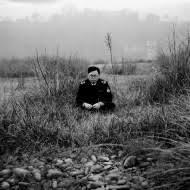 It is exactly at the moment of crossing the border, of making a mistake and doing things in a wrong way that a new discovery happens, a new revolutionary quality change jump gets established and recognized. Glass is transparent; glass may be formed and turned from liquid to hard, same is ice. There is a great difference however: glass maybe fragile and breakable, but it is also strong and lives a long life. Ice is not a permanent material. Ice melts, it is subtle and has an additional dimension, a dimension of time. 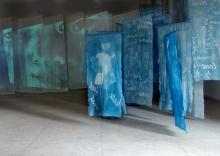 My last project made in January 2009 was an outside installation with photographs on ice. I participated along with 30 other artists in the ice and snow festival at Hovden in the mountains in the south of Norway. The official site of the event is Hovden snow and ice sculpture. 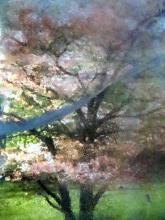 I wanted to laminate some big prints of flowering trees from upper Hudson River area outside New York City in ice. 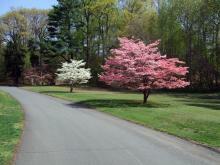 These pictures were taken during my AIR stay at Vytlacil campus of Art students league of New York last year. The idea was to bring something nearly as foreign as myself to Hovden to make a great surprise and a contrast to the surroundings, which I think I managed to achieve. I have chosen motives of flowering trees and made four prints in a perspective, from showing the whole tree, with branches and leaves to slowly getting closer, enlarging and focusing on the flowers. I wanted to create contrasts to the surroundings and the materials, contrasts of colors, temperatures and textures. Flower is warm, gentle, subtle. Strong red/magenta color was very foreign in the white snow covered landscape. 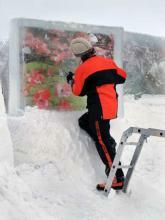 Laminating pictures of big red flowers into huge ice blocks confronted the material. Ice is strong, solid, heavy, cold. But when we look at it we still know that it is going to melt in time. The spring will come. Maybe even real flowers might pop up in the snow before the sculptures are removed. This idea really worked well in the surrounding landscape, as there were trees in similar sizes in the background of the installation, only those trees were dead and covered with snow. My sculptures reminded people of other places and other times, creating a vision beyond the vision, looking through. It was important how this project integrated with the surroundings and the public, this was a public space and an ordered commission work. As I did not know exactly how the technical process is conducted, I prepared something, which showed to be a much bigger physical challenge than what any of us had been expecting or prepared for. I ended up needing much more help than any other participant and more technical resources as well. The production process was not easy, as it was blowing wind and sometimes minus 24 degrees. 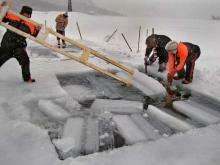 The ice was taken from the river nearby, 70cm thick blocks cut by hand in 160×120 cm size, but only the bottom 20cm of these blocks is clear. One had to cut them, while they were floating in the water, so one could turn them around and cut halfway at a time. There were many people involved, from other artists to local school kids and local administration. We managed to produce 8 pieces like that, heavy machines helped to move and to lift those heavy blocks in place. 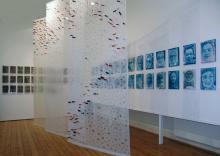 Each block consisted of two slices of ice with a picture on transparent film in the middle. Transparent film has been laminated on thin PVA sheets in order to be able to handle them easier. Each block had a weight of about 500kg, and they managed to drop one of those on my leg without breaking the leg, only the block. We managed to get the damaged piece glued together again, as ice can be glued easily with water. I actually liked all the defects in the ice after all, as it gave more life and texture to the images. There were many experienced ice artists like Mark Szulgit and Lukas Arons, who could guide me through the technical challenges. This project was my idea and initiative, but also a result of physical and technical help of many other people as well as professional advice from other artists. I think the result has been worth the effort, which is an important conclusion. Maybe I will never be able to create anything that great again. Each sculpture was about nearly 3m tall, the ice picture over 1,5m wide and over 1m high. 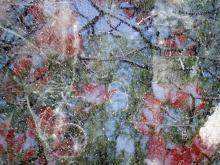 Each photograph had been printed digitally on film and laminated on a thin sheet of PVA, which has then been placed between two 20cm thick blocks of ice that was taken out of the river, with some grass, bubbles and structure in the ice. Only the bottom 20cm of 70cm thick ice blocks could be used, as it is only the bottom part that is transparent. One would have never get the same quality of ice, if it had been made artificially. I have also prepared some smaller cast ice elements, using balloons and a laser printer. The chief of the kitchen at Hovdestoylen hotel will never forget me, as I have been running in and out of his freezer room all day long for a week. These smaller pieces were used to cover the sides of the ice blocks in order to give them more life, when viewed from the sides, but also covering the seam and the gap between the two blocks of ice. Minimalist sculptors and artists of the group have condemned me for that detail, but as I have explained to them, I am not a minimalist, I am an exaggerator! This project demanded a lot of physical power and resources. It has taken two weeks and many hours of work of many people. It will probably be exposed to the public from January to May, if the weather allows it, after that it will slowly melt away, while a real spring emerges. Fabiano Busdraghi: Can you develop a little bit further the reasons that pushed you to use ice? Galina Manikova: Glass is transparent; glass may be formed and turned from liquid to hard, same is ice. There is a great difference however: glass maybe fragile and breakable, but it is also strong and lives a long life. Ice is not a permanent material. Ice melts, it is subtle and has an additional dimension, a dimension of time. Fabiano Busdraghi: The fact that the media is not a stable one is it important for you? What are the consequence on your art? Galina Manikova: It was important how this project integrated with the surroundings and the public, this was a public space and an ordered commission work. Fabiano Busdraghi: Can you tell something about the subjects of the pictures? Why have you chosen flowers? Galina Manikova: I have chosen motives of flowering trees and made four prints in a perspective, from showing the whole tree, with branches and leaves to slowly getting closer, enlarging and focusing on the flowers. I wanted to create contrasts to the surroundings and the materials, contrasts of colors, temperatures and textures. This idea really worked well in the surrounding landscape, as there were trees in similar sizes in the background of the installation, only those trees were dead and covered with snow. My sculptures reminded people of other places and other times, creating a vision beyond the vision, looking through. Fabiano Busdraghi: Is there a precise reason to print flower on ice? Galina Manikova: Flower is warm, gentle, subtle. Strong red/magenta color was very foreign in the white snow covered landscape. 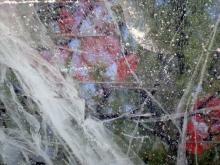 Laminating pictures of big red flowers into huge ice blocks confronted the material. Ice is strong, solid, heavy, cold. But when we look at it we still know that it is going to melt in time. The spring will come. Maybe even real flowers might pop up in the snow before the sculptures are removed. Galina Manikova mi ha mandato il link al racconto, in italiano, dell’esperienza di due scultori italiani che hanno partecipato al festival di Hovden. Grazie mille Gianmario per le tue gentili parole su Camera Obscura, e naturalmente complimenti da parte mia per il bel racconto e la scultura di ghiaccio!